The Royal Horticultural Society's Lawrence Hall in London was the place to be yesterday as the industry's journalists and press uncovered all the new products, trends and ideas for the coming gardening season at the 2011 Garden Press Event. Organised annually in association with the Garden Media Guild (formerly the Garden Writer's Guild), the event is a must for garden writers and the many exhibition stands manned by well over 70 major growers, garden supply companies and generally anyone connected with horticulture, growing or gardening were besieged by hungry journalists eager to get a handle on what will make the gardening headlines this year. With plenty of our own products on display on stand G19, Harrod Horticultural were well represented and our team fielded a steady stream of questions about our new raised bed pond, cold frame and riser , mini a-frame, lean-to ladder garden, mini manger and plenty more. Our pest control expert Julian Ives - accompanied by a hive-full of bees - was also on hand to demonstrate our new bee-based product and with space at a premium, we had to display the head-turning inflatable greenhouse on an additional stand! 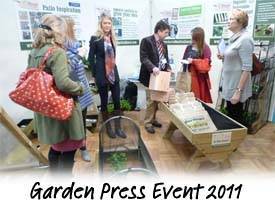 First impressions are that the sixth annual Garden Press Event was another roaring success and the many growers, gardeners and suppliers will be holding their breath to see just how the gardening media report on their products!